Zonked is a pretty tangle pattern from California tangler Barbara Finwall who shared her Olé with us earlier this Spring. I’ve been practicing Zonked for quite a while but I have to admit it’s been giving me the yips. However it’s such a great pattern that finally I decided to forget perfect and just get it out there for you all to play with. I know this will be a breeze for many of you. Barbara has given two versions, one with the curved strokes which I’ve used for my example and another with straight strokes that’s equally striking. This tangle looks great too if in Step 4 you simply fill in the smaller outer curved or pointed triangles. Barbara also adds some delicate shading in her examples, mine is straight up. Barbara illustrates the step-by-step instructions for drawing Zonked and her variation below, along with her ZIA featuring both tangles. 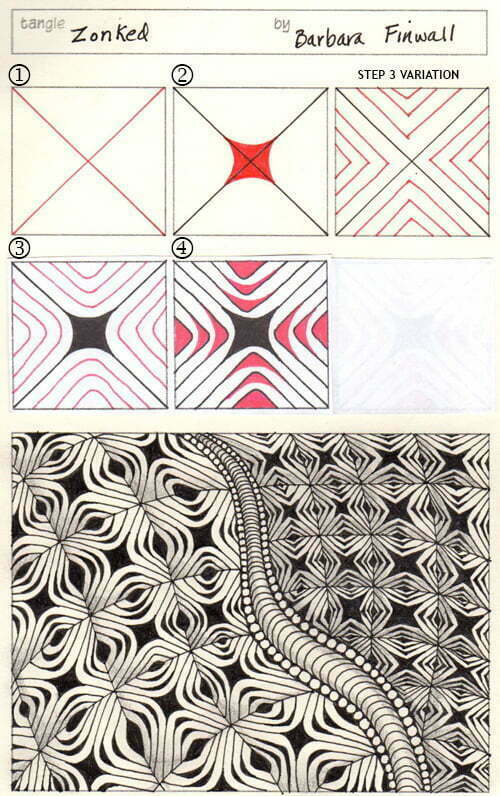 Bertha Marselis – This is a fabulous tangle pattern. I can’t wait to try it. I have really enjoyed your website Linda. Thank you for all of the hard work you put into it. I would also like to thank all those who contribute by sharing their tangle patterns. I am a newcomer but I have been having fun with all of the different variety of tangles. Jane Eileen – This is a great one! Thanks for sharing! Sandi Buchspics – I LOVE this pattern…beautiful!!! Brenda Urbanik – That’s a beautiful tangle! Margaret Bremner – Wow. I LIKE this! It’s a good way to teach a bit of Rounding too – something I was just looking for. Dayna Barnes – Wow is right…that’s stunning. I’m like everybody else…itching to try it. Thanks, Barbara (and Linda). Jennifer Hohensteiner – This is definitely WOWZERS. A great follow-up to Ole, which I also love (even though I haven’t used it yet – but I will, I will.) And Linda, I think your demo is beautiful. Sherri – This one is being added to my “favorites” group. It is great alone but absolutely stunning when done in a group to get the true feeling of the pattern. Barbara Burgess, CZT – Great tangle. It looks like it would be simple enough do but it packs a powerful punch! TFS! Cyn – Will definitely make things pop! Diane Karr – Wow, Barbara! Great Pattern. Very dynamic. I’m trying this one out first thing tomorrow. I love this pattern. Did a variation to get rid of the grid lines by starting with doing the first step into the grid corners then doing inside auras, then the little fills. This zonked pattern is one of the prettiest tangles I have seen yet. And it is so easy. Thanks Wendy. Thanks, this will be a fun one. I love this gridbased tangle.what comes out is magic. Thank you.